Have you seen the frightening headlines saying that high folate levels in pregnant mothers are associated with an increased risk of their child having Autism? Once again, there is so much more to the story than meets the eye. 1) This is only a preliminary study and it looked at blood levels of folate, NOT how much folate a woman was taking while pregnant. The evidence associating high levels are folate and Autism is premature and the real story is much more complicated than the study from Johns Hopkins University Bloomberg School of Public Health suggests. 2) High levels of folate in the blood are often related to slow metabolism of folic acid. Slow folic acid metabolism is linked to a number of genetic mutations collectively called MTHFR, which we already know are associated with an increased risk for Autism. The MTHFR mutation is VERY common and may affect up up 40% of Caucasians. MTHFR mutations are also associated with a higher risk of heart disease, depression, anxiety, schizophrenia, ADHD, neurological disorders, migraines, miscarriage, infertility, lymphoma, and leukemia. 3) Women are told to take folic acid in pregnancy to prevent birth defects, but if they have an MTHFR mutation they will be less able to utilize this form of the vitamin. When folic acid is not properly activated and used by the body for normal functions it is more likely to hang around in the blood, showing up as high serum folate. To complicate matters even more, many processed foods (bread, tortillas, crackers, protein bars, energy drinks, etc.) are fortified with folic acid. This was a public health decision that has successfully decreased neural tube defects like spina bifida, but may be detrimental to the many people with MTHFR mutations. 4) Fortunately there are forms of folate (and other B vitamins) that people with MTHFR can properly metabolize. Folate is extremely important for blood cell development, neurotransmitter function, and detoxification pathways. 5) I recommend that all women who are considering pregnancy be tested for MTHFR mutations so that they can start appropriate supplements before they become pregnant. Just to reiterate, high levels of folic acid in the bloodstream are most likely the result of a genetic mutation associated with autism and are NOT the cause of Autism. This dairy-free Paleo butternut squash soup gets it’s creaminess from coconut milk. This soup is slightly sweet and full of flavor. It’s one of my favorite comfort foods and it’s super easy to make. Butternut squash is a great source of Beta-carotene and Vitamin C, nutrients that are important for immune function and healthy skin. Butternut squash also contains Vitamin B6, Magnesium, and Calcium, which are beneficial for promoting a calm, relaxed mood. Heat the coconut oil in a large stock pot over medium low heat. Sauté the squash for 10 minutes, or until slightly softened, stirring occasionally to prevent it from burning. Add the onion and apple, and cook for about 5 more minutes. Then add the garlic and cook 2 minutes more. Pour in the stock or broth and bring it to a boil, before reducing the stove temperature to allow the soup to simmer for 5-10 more minutes. When the apple and squash are tender, add the spices and coconut milk and remove the soup from heat. Blend the mixture using an immersion hand blender, or if using a tabletop jar blender, allow the soup to cool slightly before carefully transferring to the blender. Serve warm. Have I mentioned how much I love being a naturopathic doctor? It’s amazing to watch the transformations that people make in their lives to optimize happiness and health! Sometimes the best prescription is finding out what makes you happy, and then going out and doing it. Spring is the perfect time to try something new! This delicious black bean soup has just enough of a kick to warm you up on a cold night. Black beans contain lots of healthy fiber and protein as well as a wide array of vitamins and minerals like Folate, Vitamin B1, Magnesium, and Iron. Note: If you have leftover soup try freezing it in a glass mason jar. Make sure to leave about 1 inch of airspace at the top to help prevent the glass jar from breaking during freezing. Soak beans in a large bowl with enough water to fully cover for 8-24 hours. Drain and rinse the beans. Place beans and 4 cups of cold water in a large stock pot and bring to a boil. Simmer, covered, for 30 minutes or until beans begin to soften. Add the broth, tomatoes, and spices (except for salt and pepper) and simmer for 30 more minutes. Meanwhile, melt the coconut oil over medium heat in a large skillet. Saute the onion, celery, carrot, and bell pepper for 5-7 minutes until vegetables start to soften and onion becomes translucent, stirring occasionally. Add the garlic and cook 2 more minutes, then remove from heat. Add the veggies to the beans and simmer for 10 minutes. Add the salt, pepper, cilantro, and lime juice. Discard the bay leaves. Try serving with sliced avocado or small amount of organic sour cream. These cookies are a winter tradition for me and I have made them almost every year without fail for the past 17 years. The recipe is from my Great-Aunt, via my Grandmother, and is a family favorite. I adapted the recipe to be grain and dairy free and they are just as delicious as the ones I grew up loving. Note: The recipe calls for Hachiya persimmons, which are the tear-dropped shaped variety that is used mostly for baking. Hachiya persimmons are extremely astringent until they are VERY ripe and they will usually need to ripen on the counter for 1 to 2 weeks before they are ready to use. Don’t worry if they develop small black spots on the outer skin, this is common while they are ripening. Preheat oven to 325 degrees F. Prepare the persimmons by removing the stems and peeling them. Place the inner persimmon flesh in a blender and blend until smooth. Transfer the persimmon pulp to a small bowl (you should have 1 cup of pulp) and mix in the baking soda; let stand. In a large bowl, mix together the flours, salt, and spices. In a separate bowl, blend the coconut oil and sweetener using a hand mixer. Mix in the eggs and persimmon pulp mixture. Add the wet ingredients into the dry ingredients and mix well. Add the pecans and raisins. Oil two cookie sheets and spoon the cookie dough onto the sheets. Bake the cookies for 35-40 minutes, or until done. A recent article written by Danielle Walker, author of the popular Paleo cookbook, Against All Grain, tells an inspiring story of how she completely turned around her health and her life through dietary changes. Walker suffered from a debilitating digestive illness called Ulcerative Colitis and found herself in constant pain and unable to care for her family. After working with a naturopathic doctor and eliminating grains, dairy, refined sugars, and other foods that she was sensitive to, she was able to get off her medications and prevent surgeries and further hospitalizations. The Paleo diet has gotten a lot of attention in the popular press lately and it can be easy to dismiss as simply one more fad diet. The basic premise of Paleo is to eat unprocessed whole foods and to avoid grains, dairy, and other foods that tend to promote inflammation. Inflammation in the body can cause chronic pain and has been shown to trigger a myriad of chronic diseases. I have personally seen the benefits of the Paleo diet in people with autoimmune diseases, diabetes, and PCOS (Polycystic Ovarian Syndrome). By replacing inflammatory foods with healthy, whole, unprocessed foods like vegetables, lean protein, and good fats, you can build a strong foundation of health and wellness. Dietary changes unfortunately aren’t usually a quick fix and it can take months of sticking to a new plan before the true results become obvious. However, with patience and motivation, the benefits of diet are often profound and long lasting. I often recommend a basic whole-foods-based diet like the Whole30, which cuts out sugar, diary, alcohol, grains, legumes, and processed foods in favor of vegetables, fruits, eggs, meat, nuts, and seeds. Although it is billed as a 30 day detox and diet plan, many people find that they feel so well eating this way that they incorporate these changes into their long-term eating choices. Some people with autoimmune diseases find that they feel best when they also avoid tree nuts and vegetables in the nightshade family (i.e. peppers, eggplant, potatoes, and tomatoes). Although these foods do not cause inflammation in everyone, some people find that they don’t tolerate them well, especially when their disease is in a flare. This diet is called the autoimmune paleo protocol, and although it can be challenging to stick to, many people experience a significant decrease in pain and other symptoms when they follow it. There are many variations on healthy, whole-foods-based diets. If you are interested in finding an individualized diet plan to help you feel your best, consider working with a naturopathic doctor or a nutritionist who is trained in whole-foods nutrition. Practitioners who are trained in nutrition can help make sure that you are eating a balanced diet with sufficient nutrients. This is one of my go-to recipes for Autumn dinners and it is always a favorite in my house. The hash is also delicious for breakfast over a bed of sauteed greens and topped with a fried egg. 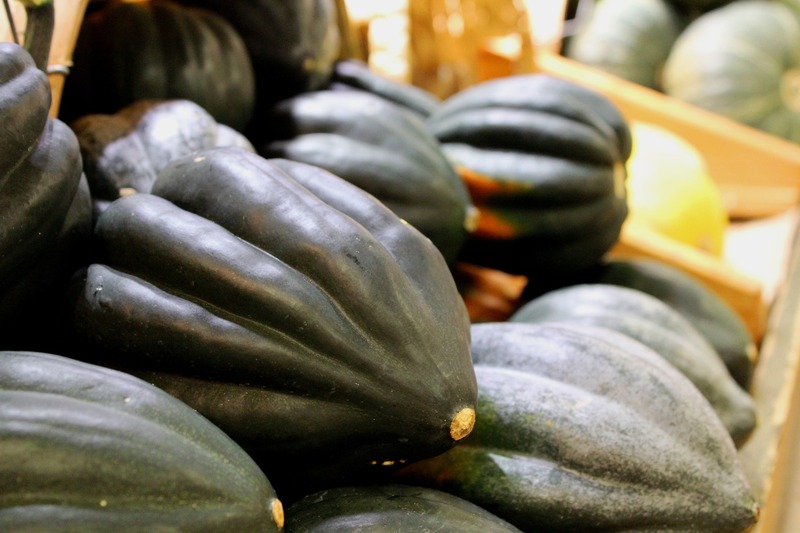 Acorn squash is a wonderful seasonal vegetable that contains lots of beta-carotene, Vitamin C, Vitamin B6, and Magnesium. Preheat oven to 375 F. Carefully split the squash in half length-wise with a sharp kitchen knife. Scoop out the seeds and discard or reserve for roasting (they are delicious and taste very similar to pumpkin seeds!). Place the two halves of the squash in a glass or ceramic baking dish, cut side down. Bake uncovered for 45-60 minutes or until the squash softens. Use a fork to test if it is done. While the squash bakes, heat the coconut oil in a large skillet over medium heat. Saute the onion, celery, and carrot for 5 minutes or until the vegetables soften. Stir occasionally to ensure even cooking and to prevent burning. Set the vegetables aside in a medium bowl and mix in the sage, thyme, marjoram, 1/4 tsp salt, and 1 tsp of black pepper. Using the same skillet you sauteed the vegetables in, cook the ground turkey. Break up large pieces and stir occasionally until the turkey is cooked through and no longer pink, approximately 4 to 6 minutes. Mix the cooked turkey into the vegetable mixture and set aside. Once the acorn squash is cooked, remove from the oven. Turn them over and drizzle a small amount of olive oil over each half and then season with salt and black pepper. Fill each half with a portion of the turkey hash and return them to the oven to bake for 5 more minutes. Each half can easily feed two if served with other vegetables or another side dish. With all the talk in the news lately about meat causing cancer (spoiler alert: the increased risk is minimal), it seems like a good time to look at the role that diet and lifestyle can play in cancer prevention. Cancer has become an epidemic in the United States. Recent statistics from the American Cancer Society estimate a lifetime risk of developing cancer at 1 in 2 for males and 1 in 3 for females. The likelihood of dying from cancer is approximately 1 in 4 for males and 1 in 5 for females. Cancer is undiscriminating and there is often no rhyme or reason to why some people develop cancers and others do not. Genetics and predisposition play a big role in some cancers, but there are also many things you can do every day to decrease your risk. When it comes to diet, it is important to taste the rainbow! Eating a variety of fresh seasonal vegetables and fruits provides many vitamins, minerals, and antioxidants with potent health benefits. Foods of different colors tend to have different types of these nutrients, so be sure to add a variety of different colors to your plate. Choose fruits and vegetables that are lower in carbohydrates and high in potent antioxidants called flavonoids. One type of flavonoid that has received a lot of attention for cancer prevention is a group of blue and purple pigments called Anthocyanins that are found in red grapes, blackberries, blueberries, plums, cranberries, and red cabbage. Typically the brighter or darker the color, the more cancer fighting potential it has. Fiber is also very important when it comes to cancer prevention. There are two main forms of fiber: soluble and insoluble. Soluble fiber is the kind that attracts water and makes things slimy (like flax, chia, oats, and psyllium). Insoluble fiber is often called “roughage” and is found in green vegetables, lentils, beans, nuts, and seeds. Fiber is like a scrub brush for the intestines and rids your body of toxins and excess blood sugar, cholesterol, and hormones, all of which helps to prevent certain types of cancer. Research has found that increased physical activity is correlated to a lower incidence of many types of cancer including colon, lung, breast, uterine, and prostate cancers. A good goal for most people is 150 minutes per week of aerobic activity. Exercise also significantly improves cholesterol, blood pressure, insulin sensitivity and blood sugar levels, and mood. You should exercise at a level of your safe target heart rate and talk to your doctor before starting a new exercise routine. Optimizing your vitamin D status is one of the easiest things you can do to prevent cancer. If you’ve never had your Vitamin D levels tested, there’s no better time than the present. Supplementing Vitamin D to get your blood levels in an optimum range of 40-70 ng/mL can decrease your risk of breast, colon, ovarian, or prostate cancer by as much as 50 percent. Household cleaners and beauty products are often full of chemicals known to be carcinogenic (i.e. cancer causing) and endocrine disruptors. Endocrine disruptors are chemicals that interfere with your body’s natural hormones. Many endocrine disruptors mimic estrogen and may increase the risk for certain hormonal cancers like breast and ovarian cancers. One major endocrine disruptor is Dioxin, which is a byproduct of the bleaching process and found in many feminine hygiene products. Another potent endocrine disruptor is BPA, a component of many plastics and food and drink containers. For yourself and your family, choose natural home cleaning products or make your own using simple ingredients like vinegar and baking soda. The Environmental Working Group maintains amazing resources for finding non-toxic household products and cosmetics. Tobacco causes more than just lung cancer. It also increases your risk of head and neck, stomach, kidney, bladder, pancreatic, ovarian, and cervical cancers. Quitting can be hard, but don’t be afraid to ask for help. There are many medications, supplements, and acupuncture treatments that may make it easier to quit. Disclaimer: This article is purely informational and is not meant to represent a treatment, prevention, or cure for a specific disease or health condition and is not intended to be a substitute for professional medical advice, diagnosis, or treatment. Always seek the advice of your physician or other qualified health care provider with any questions you may have regarding a medical condition or treatment and before undertaking a new health care regimen, and never disregard professional medical advice or delay in seeking it because of something you have read on this website. 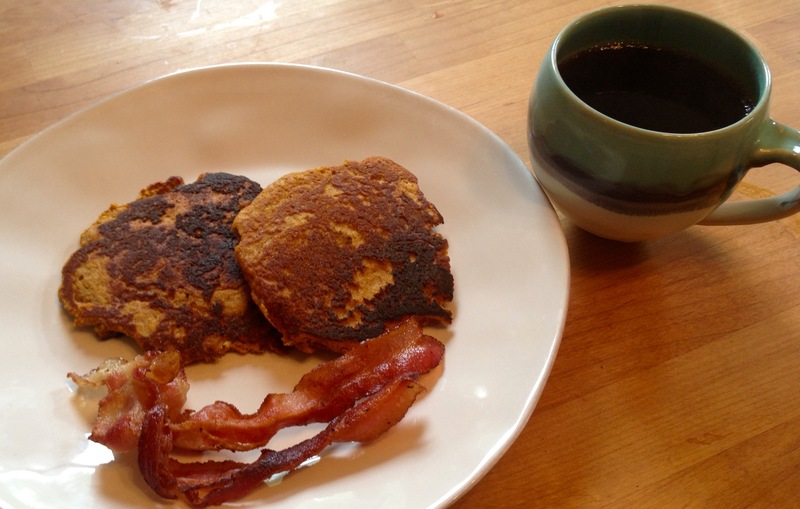 These grain-free pumpkin pancakes are delicious any time of the year, but are an especially satisfying treat on cool Autumn mornings. Try serving them with a small amount of Grade B pure maple syrup and chopped hazelnuts. Pumpkin is a great source of fiber, beta-carotene, and Vitamin C and a wonderful way to eat seasonally. Beat eggs in a medium mixing bowl. Add pumpkin puree, honey, and 3 Tbs melted butter or oil and mix well. In another bowl mix the flour, baking soda, and spices. Add the dry ingredients to the wet mixture and blend well. Melt a small amount of coconut oil in a large skillet over medium low heat. When the skillet is hot but the oil is not smoking, pour 1/3 cup portions of pancake batter into the pan so that the pancakes fill the pan but don’t touch. Cover the skillet with a lid and allow the pancakes to cook for approximately 3 to 5 minutes before flipping to cook the second side. Test the pancakes before flipping by sliding a spatula under them. They are ready to flip when the bottom has browned and the spatula easily slides under. Cover and cook the second side for an additional 3 to 5 minutes or until both sides are browned but not burnt, and the pancake is no longer wet in the middle. The pancakes can be kept warm in a low oven (150-200 degrees F) while you cook the rest of the batter. Add more coconut oil to the skillet as needed so the pancakes don’t stick. Note: Grain-free pancakes are more delicate than typical pancakes. They burn more easily and should be cooked at a lower temperature. They cook more evenly when the batter is carefully spread out in the pan with the back of a spoon. Read More Select Category Natural Health News Recipes Tips for the Season What is Naturopathic Medicine? Everything on this website is intended for informational purposes only. It is not meant to represent a treatment, prevention, or cure for a specific disease or health condition and is not intended to be a substitute for professional medical advice, diagnosis, or treatment. Always seek the advice of your physician or other qualified health care provider with any questions you may have regarding a medical condition or treatment and before undertaking a new health care regimen. Please never disregard professional medical advice or delay in seeking it because of something you have read on this website.